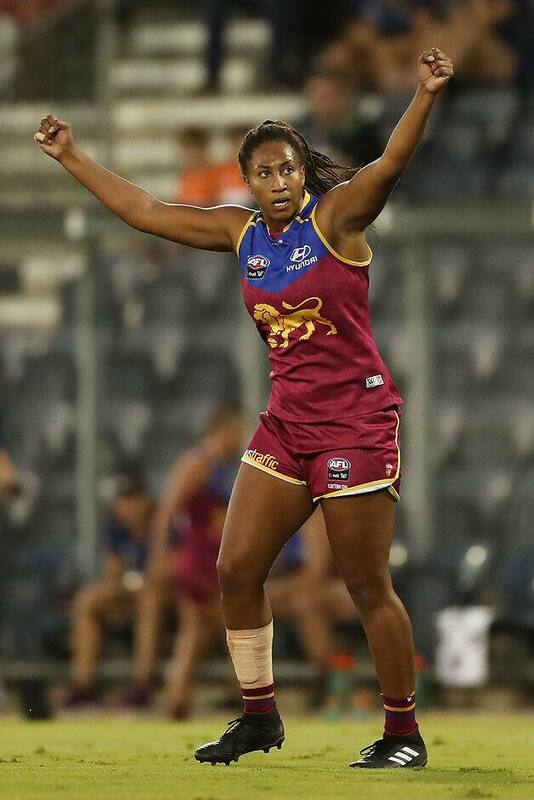 A 40-POINT win by Brisbane over Greater Western Sydney has kept the Lions in the mix for the NAB AFLW Grand Final as the competition's final round begins. Sabrina Frederick-Traub kicked four goals and Jess Wuetschner three as the Lions scored a 10.4 (64) to 3.6 (24) win at Blacktown International Sportspark on Friday. Down 7-0 early, the Lions slammed on the next seven goals, with six of them in the first quarter. Brisbane kicked the highest score in its history, booting more than six goals in a game for the first time. AFLW: Who can make the Grand Final? The win lifted Brisbane to second place on 16 points, level with pacesetters Western Bulldogs and Melbourne, who clash on Saturday. The big win moved Brisbane ahead of Melbourne on percentage. While the winner of the match between Melbourne and the Bulldogs will advance to the Grand Final, Brisbane would prefer a Demons loss and needs Collingwood to defeat Adelaide on Sunday to snare the other spot. "There was some things that we wanted to do forward of centre in terms of moving the ball quickly and it was just one of those freakish quarters where most things go right," Lions' coach Craig Starcevich said. "People having shots from pockets and they are going in and all sorts of things, a lot of things went right early." The loss ended a four-match unbeaten streak for GWS, who went into the game third, two spots ahead of Brisbane. "Tonight we couldn't go with their intensity when it was really on the line and that's disappointing and that's where we've got to find a way to compete better," Giants coach Alan McConnell said. "We led contested ball by six, five minutes into the game, we had three shots on goal then it all turns to s***. "When it mattered, when it was a one-on-one game pretty much, we weren't good enough, that's the big lesson." There was no inkling of the Lions' first-quarter onslaught in the first few minutes, with Britt Tully kicking the opening goal for the home team. However, Frederick-Traub and Wuetschner cut the Giants' defence to shreds. The Lions' penetrating kicking into the forward 50 was too slick for the Giants, who were too sloppy when in possession. The Giants stemmed the tide after the first quarter, but Brisbane kicked the only goal of the second and third terms to extend its lead. Courtney Gum kicked a goal for GWS in the opening minute of the third quarter to briefly revive the home fans' hopes. But the Giants couldn't get the deficit below four goals and Brisbane booted the last two majors to boost its percentage.